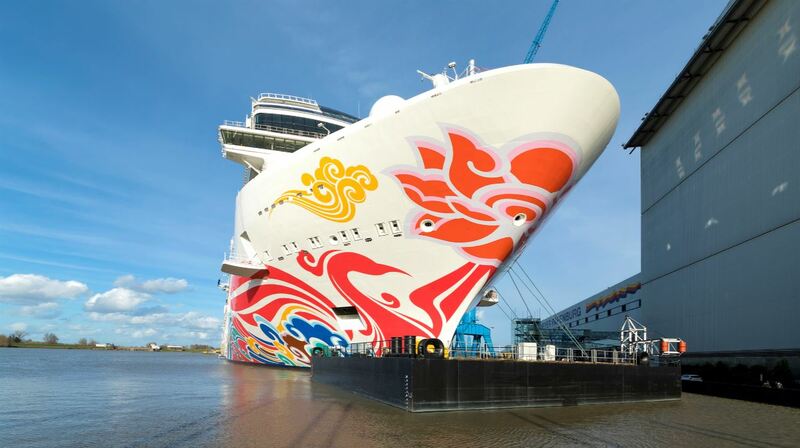 Norwegian Joy, the new cruise ship for Norwegian Cruise Line, is set to leave the Meyer Werft Shipyard in Papenburg on Sunday, 26 March 2017 to be conveyed on the river Ems to Eemshaven (Netherlands). The ship is planned to arrive in Eemshaven on Monday evening, before setting off on a short adjustment run on the Outer Ems. Later on the ship will go through several days of technical and nautical sea trials on the North Sea. 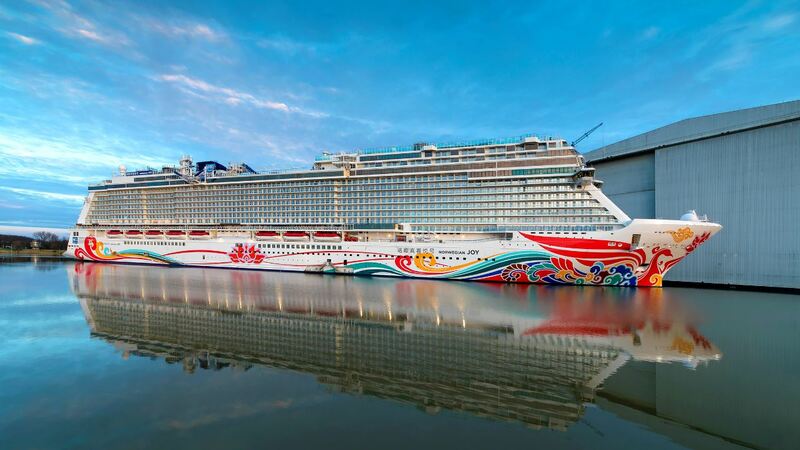 Norwegian Joy, the second ship in Norwegian’s Breakaway Plus Class, which is custom designed for China, was floated out of Meyer Werft’s building dock on Saturday 4 March in Papenburg. After some remaining work, tests and trials while the ship was berthed at the yard’s pier Norwegian Joy is set to leave the shipyard and commence her conveyance of the river Ems, towards the North Sea on Sunday, 26 March 2017. A team of river pilots from Emden will be responsible for bringing the ship through this manoeuvre. The pilots on the river Ems also looked after the Meyer Werft ships during their passage to the North Sea in previous years. The whole team trained the manoeuvre at the computerised simulator in Wageningen (Netherlands) to be better prepared for the task. 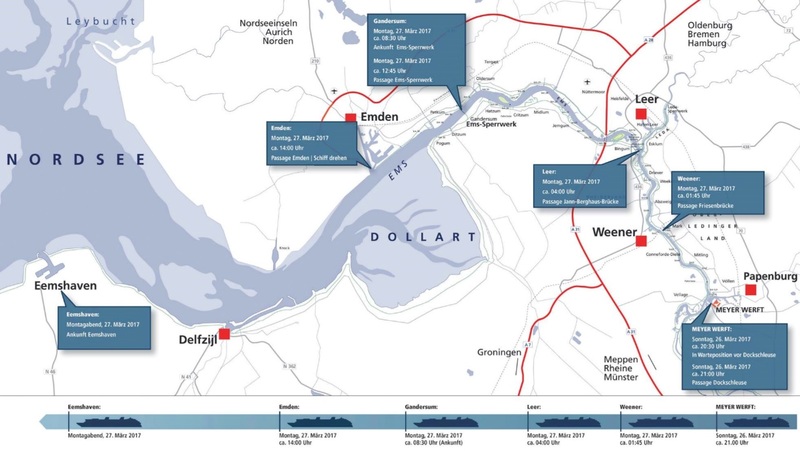 The Norwegian Joy will proceed in reverse up the river Ems to the North Sea. This approach has proven successful in the past as it makes it easier to manoeuvre the ship. Two tugs will be providing assistance in the process. The cruise liner with 168,750 GRT, with a capacity for about 4,200 passengers, is one of the largest cruise ships to be built in Germany. After completing the technical and nautical sea trials on the North Sea, the ship will be handed over to the owners on April 27 before setting off for Asia, where it will be serving the growing cruise market in China. Norwegian Joy is designed to cater to the vacation desires of Chinese guests and will provide a multitude of VIP accommodations including The Haven by Norwegian, the line’s exclusive, ship-within-a-ship suite luxury complex. The private enclave will include an all-new Observation Deck that features 180 degree views, and a Concierge level, an all-new accommodations category which will provide a VIP experience and feature larger balcony staterooms. Further accommodation offerings will include staterooms designed specifically for families and a multitude of connecting staterooms, for extended families traveling together, as well as a wide array of mini-suite, balcony, ocean view and interior staterooms, many with virtual balconies. Norwegian Joy will alsooffer some engaging and innovative activities including a first-ever two-level racetrack at sea, an open-air laser tag course, thrilling simulator rides and hover craft bumper cars. For a closer look at Norwegian’s newest vessel visit our introduction to Norwegian Joy. With 28 different food and beverage outlets, Norwegian Joy also promises to become a true foodlovers paradise offering everything from Chinese hot pot to sophisticated French haute cuisine, the freshest Japanese sushi to the highest quality American steaks and burgers. For a closer look at the culinary offerings on board Norwegian Joy visit the culinary offerings on board Norwegian Joy.